Now Easter is over and we can get back to the task at hand. Patterns!! Over the holiday I made 5 different style amigurumis with plastic eggs in them. So that you can hide goodies in them and at the same time use up all those eggs that are left empty after the big hunt. And then while having a movie night with my youngest son I made Rosey and Browning. But I know that many of you might not have those plastic eggs on hand and last night I made the yellow monkey without the egg. 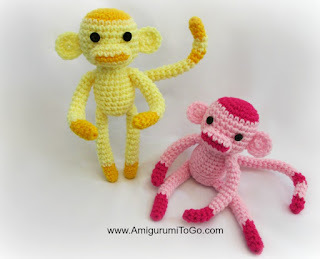 So there will be 2 patterns for the monkey, one with egg and one without! I'll do my best for the others too but we'll just focus on what I've got right now, lol The monkey patterns will be coming first. I don't have a date release it'll be just as soon as I get the patterns edited and proper photos taken. I hope you all had a wonderful Easter holiday! Impatiently waiting for Frog Catches Flies. Really want to make some for my frog collecting sister. Hope you see you soon! My Grand daughter really wants a MIni Mouse. Is it possible to create a large and a small size of her? if you put a egg in could you take it out if in the future you decided you didn't want the egg in it? LOVE your frog catches flies, FROGS are my favorite, but all your patterns are AMAZING! Thanks so much for sharing your wonderful talent! Please, please, please.....make a horse tutorial!